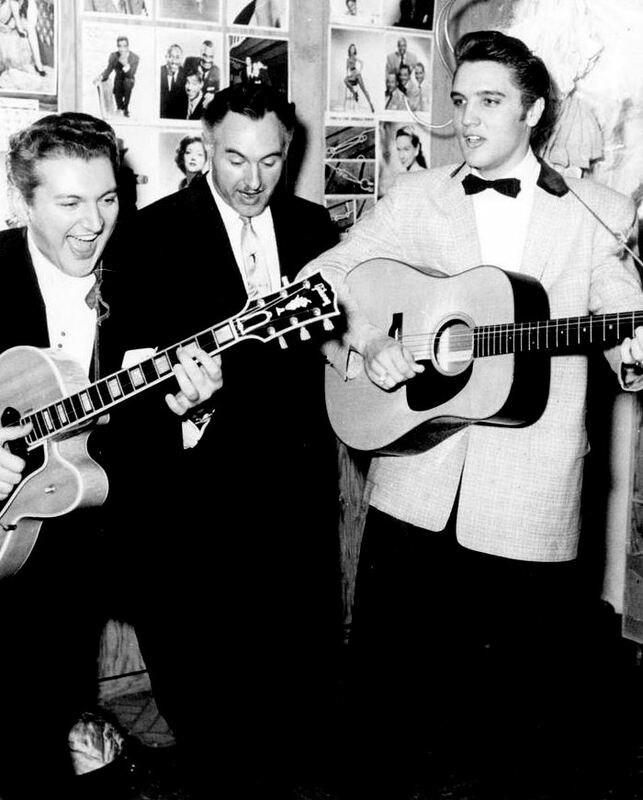 In 1956 there were two show-biz performers who had legions of faithful fans and who generated mega-watt publicity: Liberace, who ruled Las Vegas and had a hit television show, and Elvis Presley, the young Sun Records star in the early days of his legendary career. Liberace was the darling of the older middle-class, and Elvis was the King of the exploding rock ‘n’ roll generation. Both were famous in 1956, and both were raking in the cash. Even though Elvis later became a huge Las Vegas superstar, his first appearance there — at the New Frontier Hotel in April, 1956 — drew less-than-impressive audiences. 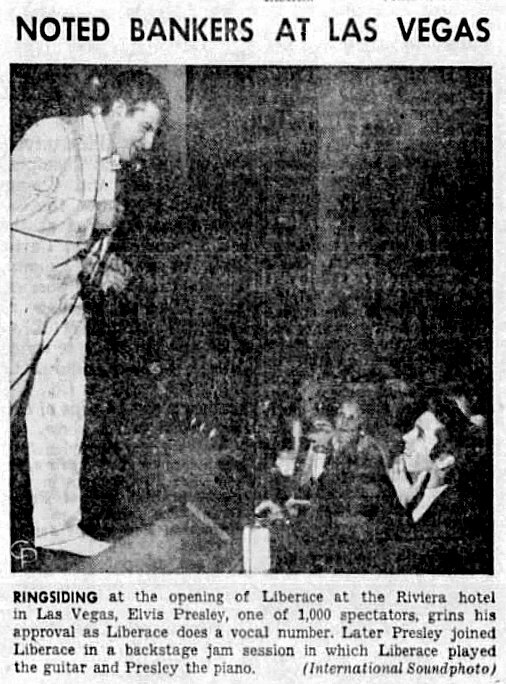 Teenagers were not a ticket-buying force in Vegas, and their parents and grandparents were packing them in at Liberace’s show. 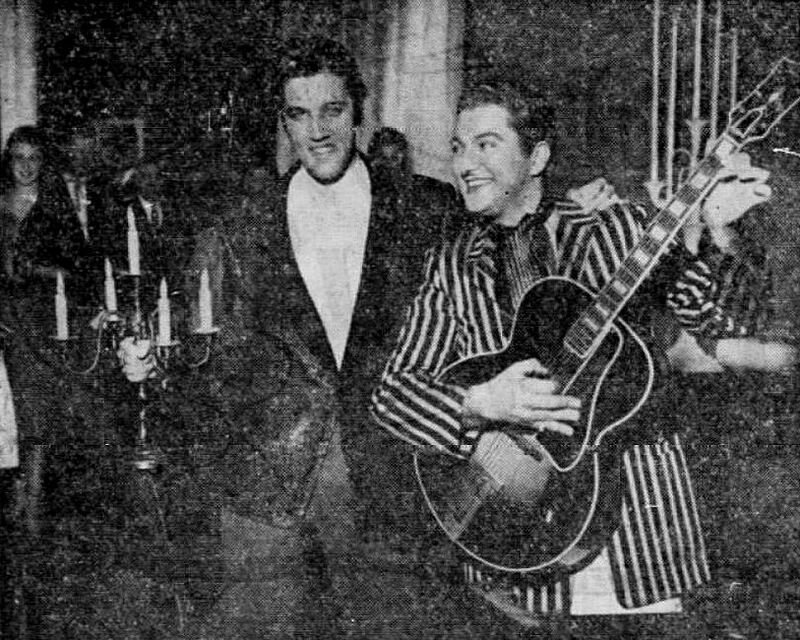 During this disappointing run, Liberace decided to check out the show of the much-talked-about Elvis Presley, and Elvis returned the favor and took in Liberace’s. The photo below was taken in April, 1956, with Liberace’s brother, George, in the middle. The meeting was also captured on film, where you can see Lee really hamming it up. And, again, YouTube shows us film footage of this “switcheroo” meeting, including footage of a ringside Elvis Presley being introduced from the Riviera stage by Liberace. First two photos from the Associated Press wire service; newspaper articles as noted. More photos of E and Lee — and more on their meetings — can be found in the post “Elvis Presley and Liberace Shared a Love for ‘Opulence'” at the Elvis History Blog, here. Click pictures and articles to see larger images. This entry was posted in 1950s, Celebs, USA: Las Vegas and tagged Elvis Presley, Liberace, Vintage Las Vegas. Bookmark the permalink.